Many parts of this new story will likely make you soar with the touching narration by Jeremiah, a 12-year-old baseball fanatic and heart transplant survivor. He is funny, perceptive, and sees the world in ways others only understand after he explains. He speaks like an old soul, using the courage from his operation to guide his thoughts. His love of baseball and how it is played leads to many comparisons to everyday life. Along for the ride is Walt, his adopted dad, who discovered baby Jeremiah at his workplace one morning. The mother had purposely left Jeremiah there hoping someone like Walt would care for him. Sounds rather unlikely but it happens. A baby was left at a school I taught at a few years ago. When Walt takes a job in a different town, there are new friends both young and old, and a new doctor for Jeremiah. They each are eventually touched by the wisdom of this new boy in town. With 43 short manageable chapters, this would make a great read-aloud. There’s one sub-plot I wish had more closure, but I know the world is not perfect. FULL PLOT (From AMAZON) Jeremiah is the world’s biggest baseball fan. He really loves baseball and he knows just about everything there is to know about his favorite sport. So when he’s told he can’t play baseball following an operation on his heart, Jeremiah decides he’ll do the next best thing and become a coach. No bullying. Jeremiah is accepted and kids are respectful toward one another. It does happen in real life if you look for it. Whether you love or despise the sport of baseball, themes of understanding, goal setting, and persistence will ring true for any reader. Soar is more a book about life. Kids who love robotics will enjoy the subplot here. Dad Walt programs robots for his job and Jeremiah often speaks to the robots as if they are human. Jeremiah must deal with leaving the one friend who understood him in his old town and trying to get that same connection with Franny, the girl who lives nearby in his new town. Thoughtfully brought to the pages with empathy and meaning. The insights into what a heart transplant patient must go through after the operation are revealing and handled in a way that should give hope to anyone facing an uphill battle. This due in a large part to how Jeremiah handles each step. FAVORITE LINE: I’d just say to every kid who doesn’t want to go to school, if you’d been sick for a few years and couldn’t go much, like me, you might think about the whole experience differently. 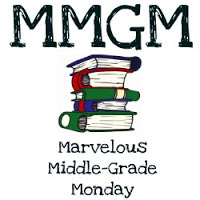 This entry was posted in Reviews and tagged Joan Bauer, male protagonists, Marvelous Middle Grade Monday, MG book reviews, Middle grade, Soar. Bookmark the permalink. Sounds like a great story and unique with the heart transplant. And with the baseball theme, it could draw in boys. Glad you liked it. Can’t wait to read it! Baseball! You know what? I love how this story doesn’t concentrate on what this kid can no longer do and how he works through it doing something else. Instead, it shows a kid who takes the crappy lumps life handed him and stuck with what he loved just in another way. That is true acceptance and perseverance. Great lessons to teach at this age. Thanks for sharing this one! Sound uplifting and wonderful for a young kid to read. Yay for no bullying. I know bullying is a problem, but I feel bullies are over represented in middle grade novels, and younger kids’ books–almost like bullying is the go-to challenge for an author to give their protagonist. And a baby was left at your school!? Wow. That sounds like a story in itself. I hadn’t heard of this one, but it sounds great, especially for boys. Thanks for sharing! Great review, Greg! I’ll look for this one. I switched high schools in 10th grade, lots of challenges. More books for boys! I really want to read this book! I had herd of it, but your review really makes it sound so enticing. Thanks for the post. I will check it out. I really like this author. Looking forward to reading this one! This one’s going on the list. You have become my place to look for sports books I can recommend, and maybe even read. Generally I’ve steered clear of the genre, not because I dislike it, rather that it didn’t interest. But, you’ve shown me another side to it, and for that I’ll always be grateful! Reminds me a tad of Edward’s Eyes. I would love this story and I am hoping to read it. Also loved this one, Greg. So good. What a great kid!